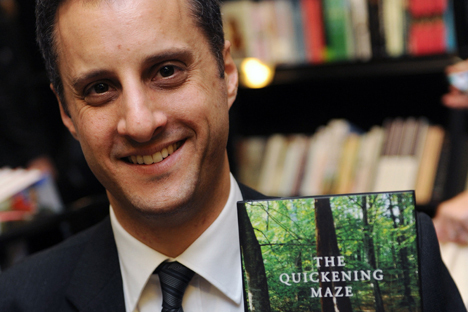 The Booker Prize-winning British author, Adam Foulds was in Moscow to participate in a literary event. The novelist, whose book ‘ The Quickening Maze’ has been translated into Russian, spoke about the historical fiction he writes, his preferences in Russian literature, and the drive to persist with difficult philosophical questions through his work. Adam Foulds, the award-winning British novelist and poet, visited Moscow to take part in a in the Literature Summer event, organized by the British Council Russia and Ahmad Tea.He spoke at a public discussion on the subject of, “Strange people: genius and crazy, as the heroes of literature.” Foulds talked on a range of issues after the lecture in a freewheeling interview with RIR. You reference genuine historical events in your novels: from the life of a 19th-century British poet to last century’s Mau Mau uprising. How do you come up with these plots? It is different in every case, but the historical events I have written about are interesting to me because of their present relevance. The Quickening Mazе has lots to do with questions of our understanding of the environment and our relationships with the natural world. Those questions are as urgent now as they were then, and this was part of what pulled me into that story. It is just luck when you come across something interesting that sticks in your imagination and keeps calling you back to it. I read about the events that were the seed of The Quickening Mazе when I was taking my first degree; they stayed with me, and 10 years later I wrote that novel. My recent novel is set during the reconstruction of Sicily following World War II. This was a period when the mafia was re-emerging, and the novel is particularly about that process. I found it an interesting time because it demonstrated the complexity and confusion that the presence of an occupying force brings to a country. Some of the factors at play reminded me of the contemporary situation in Afghanistan and Iraq. Have you ever thought about writing about an episode from Russian history? What events do you feel are most interesting for literature? When is Russian history not interesting? I’ve read a lot of history books about Russia, and obviously I’ve read a lot of Russian literature. I don’t feel that I personally should take it on, although I did just have a profound experience in the avant-garde art museum [the Tretyakov Gallery on Krymsky Val]. I love that kind of art – abstract art. You get a very intellectual, moral and political vision from that period. It is very idealistic and incredibly impressive. It’s interesting to see what became of that moment, how it was lost and how everything changed entering the 1930s. There were great female Russian artists in that period. Some of the scenes were very liberating for women and had the potential to open up a revolutionary movement amongst women – I find that very interesting. I bought a painting from Russia on a recent visit to Italy. Between 1920 and 1930 there was a Russian art school comprising of Malevich, Popova and others. It was fine art with an underlying element of practical engineering and design. Its conception was very much “let’s completely remake the world in this beautiful new abstract way.” It was disbanded in 1930 by Stalin, I suppose. I think I might like to research that some more. Pushkin, and indeed a lot of Russian literature, was greatly influenced by Byron. Do you think that Russian writers have affected British literature in a comparable way? For sure! I mean the 19th-century Russian novelists have had great influence all over the world. Tolstoy, Chekhov, Dostoevsky … You get a great deal of moral analysis from classic Russian literature. British poetry readers also hold Russian poets in high regard: Mandelstam, Akhmatova and Tsvetaeva are very widely read amongst literary people in Britain. What Russian writers do you like? It’s a long list! Gogol, Lermontov, Tolstoy to start with. Chekhov is inescapably wonderful. I was reading Isaac Babel’s short stories recently, which I liked very much. They are just stunning. Red Cavalry is a powerful kind of reportage and one of the best pieces of war writing that I’ve read. In terms of poetry I like Kharms and have recently reread some Mandelshtam. What about contemporary Russian literature? Are there any authors that stand out for you? I haven’t delved that deeply into contemporary literature. Victor Pelevin is quite widely read and I’ve heard a little bit about him – but his style isn’t really for me. I’ve read novels by Ulitskaya and enjoyed them a lot. I’m also familiar with Limonov. I really need to learn more about contemporary literature. One of the joys of coming to Moscow is finding out more and getting recommendations! What would you say Russian and British literature have in common? Generally speaking the world is growing together. When I was here for the first time in 2011, I was surprised at how international and connected the audience was. They looked like the kind of people you would find in Brooklyn or East London: young, very smart, fashionable and intellectually engaged. I have been to many different places and have seen the same audience everywhere. There is a lot that connects us more strongly than ever before. We read each other’s newspapers and social media. I think that we share an international intelligentsia. What about the topic of today’s public talk – “Strange people: genius and crazy as the heroes of literature”? Why do you need all these characters? Some authors prefer to tell stories in a very smooth way, but I often like things that are more destructive, with energy that is a bit more difficult. I use that to produce images of a society and people in particular moments. Extreme characters are useful to achieve this effect – Dostoevsky is famous for this in terms of Russian literature, of course. Extreme characters force you to engage with really big questions such as “What does it mean to be a person”, “What are our priorities?”, “What are our moral obligations?”, “What are we doing?” It is naïve and adolescent in one way, but that is one of the privileges of being a creative person and an artist – you get to keep asking those kinds of naïve questions. The only book of yours that has been translated into Russian is The Quickening Maze. Why do you think that this book was chosen? Are there any plans for your other novels to be translated? I suppose The Quickening Maze might resonate with Russian readers because poets and poetry have a similar significance in British and Russian culture. I wrote that book partly out of my love of this in the British literary tradition. I know that British writers feel the same way about British poets as Russians do about Pushkin and Akhmatova; these are people who have a real kind of spiritual meaning for readers, and I wanted to celebrate that idea, to create my own relationship with it. I can’t say if there are plans to translate any more of my work into Russian, as that is up to the publishers and my agent. I don’t really know what is happening in that area.